Up to 1914, the power of the infantry was counted in the number of rifles it possessed. The infantry company is a reflection of this. Each company was composed of about 250 effectives, nearly all of whom were riflemen. The company was divided into four sections (similar to a platoon), which in turn were divided into two half-sections of two squads each. The squads were relatively unwieldy and limited in their functionability and effectiveness, owing to their size and their limited amount of fire-power. There are also 4 stretcher-bearers which are attached to the battalion staff but are at the disposal of the company. Beginning in 1915, the number of men comprising a company was reduced from the theoretical strength of 250 to roughly 215 men, mostly to compensate for casualties. This change was a gradual one which was not fully completed until the end of the year. Use of grenades had been conspicuously low in the French army until the spring of 1915 when newer, more effective models were distributed. Coinciding with this development, detachments of grenadiers were created at the company level, composed of 16 men with 1 NCO at the head. Eight of these men (with 1 corporal) were trained as bombadiers, utilizing an array of light trench engines (mortars, catapults, cross-bows, etc.). At the beginning of 1916, the Frency army began distribution of advanced infantry weapons (such as automatic rifles and rifle grenade-launchers). This led to the progressive development throughout 1916 of small-unit level tactics, particularly on the squad level. Squads could now operate much more autonomously than before and with greater fire-power. Thus, the decrease in the number of effectives was compensated for with a smaller more potent force. The traditional rifleman was done away with in favor of a multi-arms assault trooper referred to as a voltigeur. Literally meaning "vaulter," the new designation drawn from a Napoleonic term reflected the expanded training of the infantryman (hand and rifle grenades). Beginning in the fall of 1917, detachments of "floaters" gradually came into use. However, these "floaters" were not always available and thus the size of a squad fluctuated. At the end of the war, the infantry squad was to be done away with entirely. 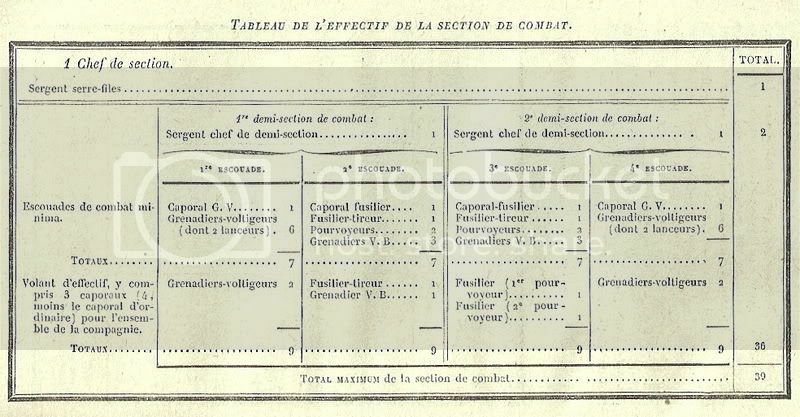 Instead, a section was now composed of 3 combat groups. This change acted to both consolidate the number of effectives in a company and concentrate their fire-power. It was the last stage of evolution: a small, mobile force which was highly adaptive and well armed. Although this organizational change was not widely implemented before the war came to an end. Bouchery, P. and F. Vauvillier. "1916, Le Poilu de Verdun." Militaria Magazine no. 39 (Nov. 1998): . British General Staff, ed. French Trench Warfare, 1917-1918: A Reference Manual. Battery Press: Nashville, 2002. Grand Quartier Général, 3e Bureau. Manuel du Chef de Section d'Infanterie. Jan. 1918 ed. Imprimerie Nationale: Paris, 1918. Sheffield, Gary, ed. War on the Western Front: In the Trenches of World War I. Osprey Publishing: Oxford, 2007. Sumner, Ian and Gerry Embleton. The French Army 1914-1918. Osprey Publishing: Oxford, 1999. Vauvillier, François. Nos Poilus de 1914-1918: L'Infanterie. Histoire & Collections: Paris, 2006.